Last year brought a frenzy of home sales in Summerbrooke that was last seen (before) the explosion of the housing market in 2004. Though buyer activity has slowed from last year's peak, this popular NE Tallahassee golf course community continues to participate in the housing market recovery. 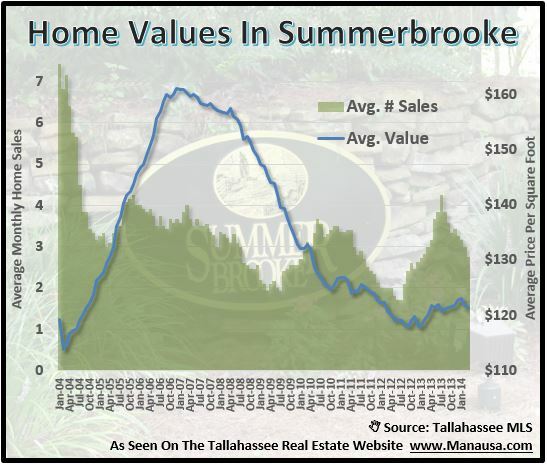 As one of the top selling neighborhoods in Tallahassee (along with Southwood, Killearn Lakes Plantation, Killearn Estates, and Bull Run), we keep a close eye on Summerbrooke to stay on top of the changing trends for the entire Tallahassee real estate market. Thus far in 2014, there have been 4 homes sold in Summerbrooke, 2 were foreclosures and 2 were arms length. Even as the foreclosures dry up, the arms length sales recorded an average sales price of $415,000 and a value of $128 per square foot. That means you are getting a 3,240 square foot home for just over $410K in a highly desirable NE Tallahassee neighborhood. Currently, there are 23 homes for sale in Summerbrooke, and 40% of those are already under contract. 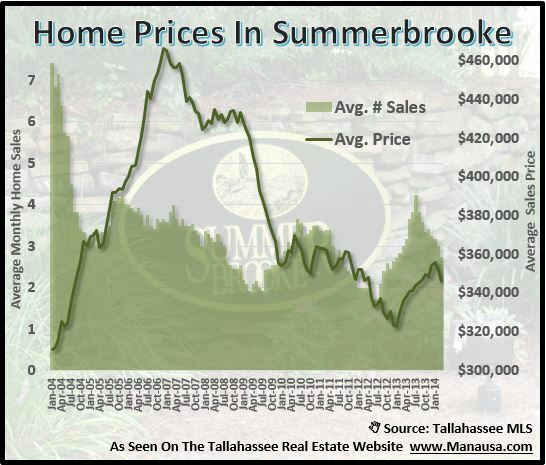 After hitting a market low of 2 home sales per month back in September of 2012, Summerbrooke has seen sales rebound as high as four home sales per month, and the current rate of sales is just over 3 per month. Home values continue to rise after hitting bottom in September of last year. Distressed properties sales have declined greatly, though when they do have some close, we see average values decline (as we can observe currently in early 2014). Home prices continue to recover from a bottom found in January of 2013 and only recently show a reduction due to the foreclosure sales. Currently the average arms length sales price of a home in Summerbrooke is around $360,000, while the distressed homes have sold for an average of $309,000. With the falling number of distressed properties available in Summerbrooke, their impact on the "average" will be greatly reduced, likely allowing prices to go higher in 2014. The following map shows the Summerbrooke homes that are on the market today. If you want more information on a particular home, simply click on the marker on the map and it will open up the listing to show you up to 25 pictures of each home. The following is a list of all homes sold in Summerbrooke (recorded in the Tallahassee MLS). I hope you were able to learn something from this Summerbrooke Home Sales Report, please drop me a note if you have any other questions or concerns that I can help you with.